Norah Bird casts her vote in Orono on Tuesday. Six out of seven members of the Old Orchard Beach Town Council were ousted in a recall election Tuesday. 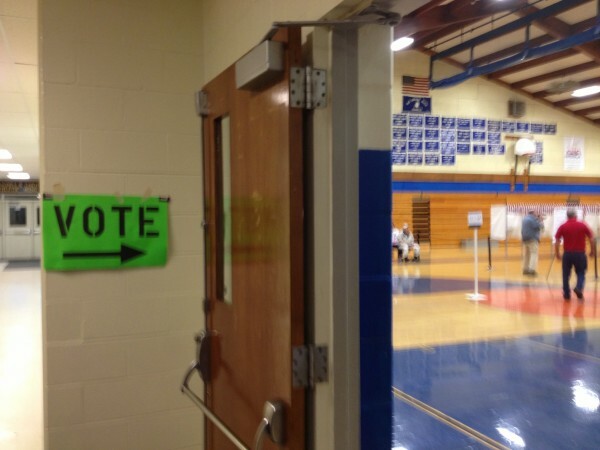 Voting took place at Old Orchard Beach High School. John and Colleen Robbins chat with elections clerks before casting votes in Orono on Tuesday.
" I cannot remember a voting day as slow as this." said election clerk Dorothy Plummer on Tuesday. Plummer (second from left) checks in Norah Bird (left) as election clerk Carol Mower and election warden Geoff Gordon watch at the Orono municipal building on Tuesday. Many towns went to the polls Tuesday to vote on school budgets and fill seats on community boards. At least two school districts voted down their budgets, with a third headed toward rejection, and voters in Old Orchard Beach recalled six of their seven town councilors. Use the links to the right to scroll to the results for a specific district or town. Six of seven members of the Old Orchard Beach Town Council were ousted in a recall election Tuesday after a divisive campaign that pitted neighbor against neighbor in the beachside town. Councilor Bob Quinn was the only councilor to survive the unprecedented election, while Councilors Laura Bolduc, Linda Mailhot, Sharri MacDonald, Dana Furtado, Michael Coleman and Robin Dayton were voted out of office. The new councilors, according to the unofficial election results, are Roxanne Frenette, Kenneth Blow, Jay Kelley, Joseph Thornton, Shawn O’Neill and Malorie Pastor. The election capped months of conflict stemming from the Town Council’s 4-3 vote in March to terminate Town Manager Mark Pearson. Battle lines were drawn roughly between the four councilors — and their supporters — who voted in favor of Pearson’s termination and the supporters of the three who opposed it. Despite being ousted, Coleman, who lost by just 11 votes, said he was happy with the result of the election. “Mostly it’s I can see myself as political collateral damage,” he said Tuesday night after the results were announced. “It turned out the gang of four, and I couldn’t be happier,” he said, referring to Bolduc, MacDonald, Furtado and Mailhot, who had voted to terminate Pearson. The recall began when residents unhappy with Pearson’s termination initiated the process of calling a special election. In response, supporters of the council majority, calling themselves Taxpayers for Truth, initiated the recall of the three in opposition, leading to the entire council facing the ax. The town charter states any seven residents may initiate recall proceedings, and once begun have 30 days to collect a number of signatures equal to at least 20 percent of the last gubernatorial election. Despite their strident disagreements, all of the councilors who spoke with the Bangor Daily News on Tuesday lamented the effect of the campaign on the council and on the town. BELFAST — The withdrawal effort made by six of the eight Regional School Unit 20 communities over the last year failed after at least three communities did not make the voter turnout threshold required by the state. Also, early returns show that the $34.3 million budget was failing by 1,767 to 1,174, with final results in Swanville still outstanding. In Belfast, voters turned the budget down, with 666 people against it and 585 in favor. Altogether, 1,280 people voted, or just more than a quarter of the city’s registered voters turning out for the election. The withdrawal won 980-291 in Belfast, but the city still came short of the turnout numbers. According to the state, each town needed to have a turnout at least equal to 50 percent of the last gubernatorial election in order to qualify for withdrawal. Northport needed 389 ballots cast in order for the vote to count, but only had 348. Belmont also missed the threshold by just 11 votes. Withdrawal advocates waiting at the polls in Belfast on Tuesday night said that they were disappointed in the results. “It would appear to me that voter apathy is alive and well,” Belfast City Councilor Eric Sanders said. “Either that, or support for the status quo,” replied Belfast City Councilor Mike Hurley. According to Sanders, the voters who did come to the polls “overwhelmingly” supported withdrawal, in some towns by as much as 75 percent. “The only question I have is why didn’t more people vote?” he asked. If the RSU 20 budget fails, as appears likely, the school district will have to start all over again with the budget process. Voters at the end of May attended an emotional budget meeting and reinstated $856,000 that the school board had cut from the budget. While the move was applauded by those who did not want to see teaching and support positions cut, many town officials and voters worried that the 17.2 percent increase to local property tax assessments for the towns of Belfast, Belmont, Morrill, Northport, Searsmont, Searsport, Stockton Springs and Swanville would be impossible. In Stockton Springs, roughly 290 people voted down the budget, with just 63 in favor, according to Town Manager Richard Couch. In Belfast, Mayor Walter Ash said that while it’s clear that the majority of voters did not want such large tax hikes to pay for the district’s schools, the no vote on the budget was not entirely good news. ROCKLAND — The school board will go back to the drawing board after voters in Regional School Unit 13 narrowly rejected the proposed 2013-2014 budget. The $27,017,561 budget was rejected 320-332. “I can say that the board, the administration and I are disappointed,” said Superintendent Lew Collins. The budget represented a 2 percent increase but because of less state aid, the communities would have needed to raise about $500,000 more through property taxes. Rockland would have picked up the largest share because of a change in the cost-sharing formula used by RSU 13. The budget also called for several positions to be cut, including an art teacher, a social studies teacher and a resource room teacher, and the reduction of a technology teacher to half-time, all at Oceanside High School East. A social studies teaching position at Oceanside West in Thomaston is also up for elimination, as well as an interventionist teacher being reduced to half-time at Oceanside West. Three elementary classroom teachers would also be cut — two at the South School in Rockland and one at the St. George School. The budget was ratified at a districtwide meeting on May 29, but fewer than 50 people turned out for that vote. The budget was rejected in Rockland, 46-93; in St. George, 35-56; and in South Thomaston, 11-21. Thomaston supported the budget in a 161-114 vote; Owls Head, 37-24; and Cushing, 30-24. Collins said the board would meet to consider changes and that it then would go to another districtwide meeting followed by another referendum. FREEPORT — Despite approval by Freeport voters, residents of Durham and Pownal on Tuesday rejected a $16.9 million bond to renovate Freeport High School, while a $25.8 million budget passed comfortably. Voters in Durham and Pownal overwhelmingly rejected both referendum questions, but the school project was still a close call. An unofficial tally for all three towns in Reginal School Unit 5 put the total votes at 2,202-2,028, a difference of 174. Pownal Town Clerk Scott Seaver said voters there rejected the plan 472-118. In Durham, voters trounced the proposal 828-287, according to unofficial results reported by Peter Murray, a volunteer with pro-expansion advocacy group Friends of Freeport High School. In Freeport, it was a vastly different story: voters favored the project 1,623-902. The other big referendum question — whether to authorize a $25.8 million fiscal 2014 budget for Regional School Unit 5 — passed by an unofficial margin of 698 votes at 2,415-1,717. In Pownal, voters rejected the budget 396-183, Seaver said. Unofficial results from Durham suggest that voters rejected the budget 701-399, Murray said. Durham voters are slated to see a 10 percent increase in the property tax rate as a result of the 2013-2014 budget and Pownal a 8.4 percent increase, while Freeport taxpayers will only shoulder a 3.1 percent increase. Jeff Wakeman, chairman of the Durham Board of Selectmen, said the anticipated property tax increases Durham would have seen from the bond, added to the increases the budget will trigger, likely contributed to the town’s no votes. Freeport voters approved the budget by a wide margin, 1,833-620. The $16.9 million bond proposal called for renovations and several additions to the high school, including nine new classrooms to accommodate projected growth in enrollment. The plan also calls for an eight-lane track and athletic field to replace the current grass field. Many voters leaving the polls Tuesday in Freeport said they voted with their children in mind. Steve Voter, 32, a father of four, pushed a stroller out of the polling station. Tucked inside were newborn twins — a boy and a girl. Wife Mikki Voter said she and her husband voted in favor of the bond. Damian Hall, 37, voted for the bond because he wanted to keep Freeport competitive with other coastal towns, particularly Yarmouth. Several residents who voted against the bond cited the athletic track as a stumbling block. Kenshi Imura, 39, an abutter to the proposed track, said he was concerned about the direct impact on his land, plus the added expense. Angie Arsenault, 36, expressed similar sentiments. She said she supports school improvements, but voted against the bond because of the athletic fields. “I understand that the school is getting to be too small, but the athletic stuff seems excessive when people are struggling to by groceries and gas,” she said. The building, which dates back to 1961, has had previous additions in 1968, 1974, 1985 and 2003. The most recent addition added six science classrooms and a performing arts center. The $25.8 million RSU 5 budget was adopted during a public meeting on May 22, and includes about $200,000 for teacher retirement payouts traditionally paid for by the state, and $70,000 to hire a math teaching strategist to help low-performing students. Voters overwhelmingly rejected a proposal for a new public safety building at the former Little Falls School location, 1,190 to 415. The town sought to replace the current public safety building, built in 1972, which “does not have enough space to meet the current needs of the police or fire departments, creating inefficient and substandard working conditions,” the town stated. Voters also approved the school budget, 1043 to 557, and elected to continue requiring votes on the budgets for the next three years, 1,162 to 437. Katherine Garrard won in an uncontested race for School Board. Voters on Tuesday rejected the proposed school budget by more than a 3-2 ratio, sending the message that the proposed 6.9 percent increase was too much. Unofficial returns show the vote was 1,625 to 1,036 to reject the $38.37 million budget, said City Clerk Susan Clements-Dallaire. The voter turnout was 16 percent, Clements-Dallaire said, a far cry from last year, when only 694 people voted and the budget passed by 5 votes. The rejection means there will have to be another school budget referendum. Auburn School Superintendent Katy Grondin said the School Committee would work on another budget as soon as 6 p.m. Wednesday night in a workshop session. A proposal to ban pesticide use on private as well as public lands in Ogunquit failed, 183-173. Voters ratified the 57 other municipal warrants on the ballot. All candidates ran unopposed and were elected to their respective seats. BUCKSPORT, Maine — Voters in Regional School Unit 25 — encompassing the towns of Bucksport, Orland, Verona Island and Prospect — approved a $13.6 million district budget for fiscal year 2014. That figure is a 2.29 percent increase over the current school year’s budget of $13.3 million. The budget was approved in small numbers, with voters from the four towns marking “yes,” 349-145. Most of the increase is a result of a decrease in state funding thanks to valuation growth in Bucksport that outpaced state averages, and payments into the state retirement system the governor has proposed. Additional hikes to special education spending costs and insurance premiums make up the remainder of the increase. Voters in the district also approved, 316-162, a bond question that will see the district borrow $2.56 million to replace the failing glass facade at Bucksport High School, which Superintendent Jim Boothby said is bleeding the district of thousands of dollars per year in heating costs. “The glass blocks have cracked, broken. We’ve got places where if you sit there and it snows and blows just right, you’ll get snow across your desk,” he said. The bond would pay for the complete replacement of the glass block and glass curtain walls that comprise most of the building’s exterior, as well as all the building’s windows. It also would pay for new air exchange units and minor improvements to the building’s main entrance. Though the details are yet to be worked out, Boothby said the renovations would save the district at least $15,000 per year in heating costs, and prolong the life of the high school. ELLSWORTH, Maine — Voters in the sprawling, 12-town Regional School Unit 24 have approved a $36.5 million budget for the upcoming school year. Voters approved the budget in a 438-193 referendum vote Tuesday. RSU 24 includes the towns of Eastbrook, Ellsworth, Franklin, Gouldsboro, Hancock, Lamoine, Mariaville, Sorrento, Sullivan, Steuben, Waltham and Winter Harbor. The budget is just 1 percent higher — about $367,000 more — than the current year’s, and incorporates decreased funding proposed by Gov. Paul LePage for municipal revenue sharing, as well as the governor’s proposal to to shift an additional share of state retirement costs to municipalities. RSU officials said that without the governor’s proposals, the budget is actually down by $30,642. Voters in the 12 municipalities also voted 382-247 to continue budget validation through referendum. The question of whether to continue voting at the ballot box for school budgets, rather than in an annual, district-wide budget meeting, is asked every three years. Four towns — Hancock, Mariaville, Sullivan, Steuben — voted to stop holding budget referenda, but their votes were not enough to swing the district. BAR HARBOR, Maine — Voters on Mount Desert Island on Tuesday validated the local 2013-2014 high school budget by a comfortable margin, despite a low turnout. The MDI High School budget of $8.9 million, which had been approved at a district wide meeting on April 3, was reaffirmed with an island-wide, 368-to-76 ballot vote. The 444 ballots cast represent only a small percentage of the total number of registered voters on MDI. Voters on MDI also weighed in on whether they should continue holding validation votes by ballot each year after the high school budget has been approved at an island-wide public meeting. Bar Harbor voters were in favor of continuing the validation votes for the high school, with 90 people supporting the idea and 78 opposed to it, but they were outnumbered by voters in other towns. Island-wide, voters decided to stop holding separate high school budget validation votes by a margin of 270 to 174. Separate votes on other education costs were held Tuesday in Mount Desert, Southwest Harbor and Trenton. Mount Desert and Southwest Harbor each approved budgets of more than $3 million to operate their local elementary schools, which have children from kindergarten through eighth grade. Trenton, which is a member of the Mount Desert Island Regional School System (formally known as Alternative Organizational Structure 91) but which tuitions its high school students to MDI and Ellsworth, voted 20 to 2 to approve a $3.2 million budget for all of its pupils between kindergarten and grade 12. Voters in Mount Desert, Southwest Harbor and Trenton also voted to stop holding separate validation votes on their respective school budgets. Other school budgets for AOS 91 member towns received their final approvals prior to Tuesday. 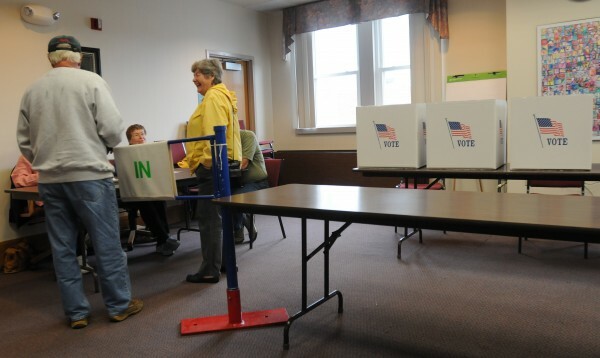 PRESQUE ISLE, Maine — Voters in SAD 1 overwhelmingly approved a $23.2 million budget for the district on Tuesday that also included a $2.3 million bond package aimed at reducing energy costs and funding needed maintenance projects. Superintendent Dr. Gehrig Johnson said on Wednesday that voter turnout was low, with approximately 7 percent of the population of Presque Isle, Castle Hill, Chapman, Mapleton and Westfield voting. The final total was 451 voters in favor and 205 voters opposed. The budget was up more than $250,000 over last year and included a bond package, which will finance upgrades at all of school district’s buildings. Some of the money will pay to convert the heating system from number two fuel oil to liquified petroleum gas at Presque Isle Middle School, Presque Isle High School, Mapleton Elementary School and Zippel Elementary School. The bond will be paid off over a ten year period at a 2 percent interest rate and also will fund handicap accessibility and security projects. HOULTON, Maine — Just 227 people voted to pass the $12.6 million budget for RSU 29, which also serves Hammond, Littleton and Monticello. The budget is up 1.36 percent from the previous year due to an increase in state funding, but it requires an increase in the local share in order to get those funds. Hammond must contribute $59,216; Houlton, $2,400,945; Littleton, $454,266; and Monticello, $360,266. Voters also opted to keep the school budget decision in a referendum during future years. Voters in SAD 32 in the Ashland area also approved their budget, with 93 in favor and 46 opposed, but decided not to keep approving their future budgets by referendum. Voters rejected such a proposal by a vote of 67-64. SAD 32 represents Ashland, Garfield Plantation, Masardis, Oxbow Plantation and Portage Lake. CAMDEN, Maine — Voters in Camden, Rockport, Lincolnville, Hope and Appleton ratified the Five-Town Community School District budget 1,040 to 377. The $11,419,000 budget for 2013-2014 was approved in each of the five communities. The budget, which is an increase of 2 percent, reduced a librarian position to half time and cut hours for a custodial position, both at the high school. The CSD oversees Camden Hills Regional High School in Rockport. The School Administrative District 28 budget, that oversees the kindergarten through eighth grade in Camden and Rockport, also was approved by a wide margin. The SAD 28 budget was approved 310 to 125, winning by the widest margin in Camden. Voters approved a $27.4 million school budget Tuesday 342– 213. The RSU budget passed overall in a 477-395 vote, despite a rejection by Hampden voters. Hampden voted against the RSU 22 budget Tuesday, with 188 supporting the budget and 219 against it. Voters supported the budget 97-45 in Newburgh, 166-126 in Winterport and 26-5 in Frankfort. The question of whether to continue the budget validation referendum process passed 321-83 in Hampden, 217-71 in Winterport, 108-32 in Newburgh and 25-6 in Frankfort. A bond question on whether to spend up to $282,000 on building repairs to four school buildings passed 258-149 in Hampden and 199-94 in Winterport. GUILFORD, Maine — The 2013-14 budget for SAD 4 was passed by a vote of 152-58. All six member towns passed the budget: Abbot, 23-8; Cambridge, 38-15; Guilford, 27-4; Parkman, 12-11; Sangerville, 32-17; Wellington, 20-3. Voters backed the MDI Regional School District budget validation 131-36, and narrowly approved continuing the budget validation 90-78. David Bowden and Paul A Paradis won seats on the Town Council with 127 votes each. There were 171 voters total out of 4,163 registered, a 4.1 percent turnout. Voters approved an amendment to the town’s charter that would allow residents to decide at annual town meeting whether they want a full-time police chief. With 40 percent of the community’s electorate showing up to the polls, 392 people voted in favor of the charter change and 335 were opposed. Residents elected two town councilors and a new five-member school committee during their annual elections on Tuesday. In Town Council elections, incumbent candidate Dennis Casey was elected to one of the two three-year positions available this year. The other seat, for which there was no declared candidate, went to Mark Lagasse, who received six write-in votes. On the school committee section of the ballot, Susan O’Roak and Rose Thompson each were elected to three-year positions, with O’Roak receiving 57 votes and Thompson getting 52 votes. The two two-year seats went to John Higgins, who received 51 votes, and Lauri Jacobs, who got 56 votes. With no candidate on the ballot, the one-year position went to Karen Marsters, who received two write-in votes and who also indicated she is willing to serve. The newly elected school committee will oversee local education as of July 1, when Glenburn’s withdrawal from RSU 26 takes effect. Voters will consider the proposed $2.3 million municipal budget and the proposed $8.46 million education budget during their annual town meeting, set for 7 p.m. Wednesday at the Glenburn School gym. Richard Peat ran unopposed for selectman and was elected with 220 votes. Rebecca Lee was voted to the Union 60 school board with 146 votes, defeating Rene Hersey, who received 92 votes. The 2013-2014 budget for Union 60 was approved by Greenville voters, 182-58. Christopher Pinckbeck and James Annis were elected to the Board of Selectmen with 140 and 129 votes, respectively. Brittany Payson was elected as Five Town CSD Rep. The school budget passed 145-53. The school budget validation process passed 126-71. The Land Use Ordinance passed 141-58. The CSD budget passed 153-58, and hte CSD validation process passed 137-69. Leonard “Bud” Belcher was selected as Newburgh’s new selectman with 100 votes, defeating Steven Burgess, a write-in candidate, who received 37 votes. Residents also voted to allow the Board of Selectmen to negotiate with RSUD 22 to buy the former Newburgh Elementary School, 112-31. Residents voted in favor of the RSU 22 budget 97-45. DEXTER — Residents in four member towns approved the 2013-2014 budget for SAD 46 by a 130-84 vote. Three of the towns approved the budget: Dexter, 75-43; Exeter, 11-5; and Garland, 32-23. Ripley voted against it 13-12. Harmony, as part of AOS 94, voted in favor of its budget 32-29. Voters returned Selectboard Vice Chairman William Hahn to the board in Tuesday’s election. He will be joined by former board member Mona Stearns, who received the most votes with 189. Hahn received 186 votes in the race for two seats. Clifford Blastow finished third with 96 votes and Frederick Campbell received 38 votes. Voters filled two expiring posts on the Town Council and elected their first post-RSU 26-withdrawal school committee during local elections on Tuesday. Their annual town meeting, which began about 8:30 p.m., however, was still underway at presstime. In the election for town councilors, Robert Rice — a write-in candidate — was the top vote getter, with 147 votes. The second seat went to Karen Walker, who had 138 votes. The incumbent candidate, Jonathan Parker, did not win his re-election bid. Parker ended up in third place with 114 votes. Brian Perkins, the other incumbent councilor, opted not to seek re-election. With regard to school committee posts, Veazie needed to fill five positions for the first time since its vote last November to withdraw from RSU 26, effective July 1. Three candidates and a declared write-in candidate stepped forward for the permanent school committee positions, two of which will be for three years, two of which will be for two years and one of which will be for one year. Winners of the three-year seats were Julia Hathaway, who had 195 votes and represented Veazie on the RSU 26 school committee, and political newcomer Karpagavalli “Valli” Vel. Gavin Batchelder, a former RSU 26 board member from Veazie, won one of the two-year posts with 232 votes, while William Reed, a former Veazie town manager, was the apparent winner of the other two-year post, for which there was no candidate, with 11 write-in votes. Eric Gasperini was elected to the Board of Selectmen. Sharon Philbrook and Linda LaPointe were elected to the MSAD 8 Board of Directors. The school budget passed 159-145 and voters opted to continue the school budget referendum process 205-97. Regina “Gigi” Baas was elected to the water district board. Peter Ault was elected to the Board of Selectmen with 201 votes, beating Gary W. Carr, who received 84 votes. Dallas Folk and David Stevenson were elected to the Budget Committee with 191 votes and 204 votes, respectively. A third open seat, as well as two School Committee seats, are undetermined pending the counting of write-in votes. UNITY — Voters in the 11 towns of Regional School Unit 3 passed by a slim margin the proposed $19.2 million budget for fiscal year 2014. Just 430 people in the towns of Brooks, Freedom, Jackson, Knox, Liberty, Monroe, Montville, Thorndike, Troy, Unity and Waldo voted for the school budget. But that was enough to edge out the 391 people who voted against it. “Very low turnout, but we are pleased the budget passed,” RSU 3 Superintendent Heather Perry said Tuesday night. Residents of the SAD 63 member towns of Holden, Eddington and Clifton approved a $9.38 million education spending plan in their respective school budget validation votes on Tuesday. The budget for 2013-14 is $190,536, or 2.07 percent, more than this year’s budget. The combined tally was close, at 235-223, according to referendum results provided by the three towns. Although residents of two of the three member towns voted against the budget, there were not enough no votes to defeat it. In Holden, the budget was approved in a 167-120 vote. Eddington residents opposed the budget in a 52-67 vote and Clifton voters opposed it 16-36. SAD 63 voters also agreed to continue the existing budget validation referendum process in a 295-151 vote. Holden voters approved it 193-86. Eddington voters favored it 72-44, while Clifton residents authorized it 30-21. Peter Burns and Clifford Emery were elected to the Board of Selectmen with 303 and 258 votes, respectively. Jacob Stoddard was elected without opposition to the SAD 6 board. Christopher Carroll, Henry Huntley and Jeremiah Ross III were elected to the Planning Board for three-year terms. Thomas W. Clifford was elected to the Planning Board for a one-year term. Sheridan Bennett, David Hall and Dana Ryder were elected to the Budget Committee for three-year terms. Alfred Fratoni Jr. was elected to the Budget Committee for a one-year term. The RSU 24 budget passed, 43-31. Voters rejected the MSAD 49 budget, with 141 in support and 185 against it. Residents voted 472-265 against a proposal to disband the town’s Police Department and contract with the Oxford County Sheriff’s Department. Voters also overwhelmingly approved the SAD 17 budget, 494-291. Results for other towns in the district weren’t immediately available. Residents voted down a question that would have allowed the city to borrow up to $1.7 million for improvements to the Stackpole Bridge with 742 in favor and 971 against. Voters approved the SAD 23 budget 936-777 and voted 1,112-577 to continue conducting a referendum to validate the school budget for three more years. Voters on Tuesday approved a $38.8 million fiscal year 2014 education budget by a 1,490 to 1,332 vote. The budget was $54,000 less than one rejected by voters May 14. In a nonbinding question, 1,349 voters said the budget was still too high, 938 voters said the budget was too low, and 496 found it acceptable. Passage of the school budget, along with the municipal budget and town share of Cumberland County operations, likely will boost local property tax rates to $14.88 per $1,000 of assessed value from the current $13.80 rate. CUMBERLAND — School Administrative District 51 voters on Tuesday approved a nearly $31.3 million fiscal 2014 budget and agreed to shut down the North Yarmouth Memorial School. Cumberland voters supported the spending plan 497-301, as did North Yarmouth, 332-226, according to unofficial results. Cumberland voted 559-237 to close the school, while North Yarmouth voted 302-268 against doing so. According to a voters guide posted on SAD 51’s website, only one of the towns had to favor the measure in order for the school to close, as called for by the state. The transition of the students to Greely Middle School is expected to happen at the beginning of the 2014-15 school year. Cumberland also approved continuing the budget validation process for another three years, 551-239, as did North Yarmouth, 404-151. Cumberland supported a $2 million expansion for Greely Middle School, 489-313, while North Yarmouth opposed it, 318-245, for a combined vote in favor of 734-631. A majority within the two towns was needed for the measure to pass. TOPSHAM — A School Administrative District 75 budget for next year that proposes a 4.4 percent hike, resulting in a 4.1 percent tax increase, earned second and final approval at Tuesday’s budget validation referendum. The budget passed 575-162. It was approved in Topsham, 162-62; Harpswell, 192-41; Bowdoin, 66-19; and Bowdoinham, 155-40. Voters on Tuesday adopted a revised Town Charter and elected Clark Whittier to the Board of Selectmen while re-electing Chairman Steve Palmer. The charter was approved, 380-148, with 44 blanks. Whittier received 349 votes for one of two open seats on the board, followed by Palmer with 336. Woodfin “Woody” Brewer received 139 votes to place third in his first campaign for an elected office. The $43.2 million fiscal year 2014 education budget was passed 591-189 by city voters Tuesday. 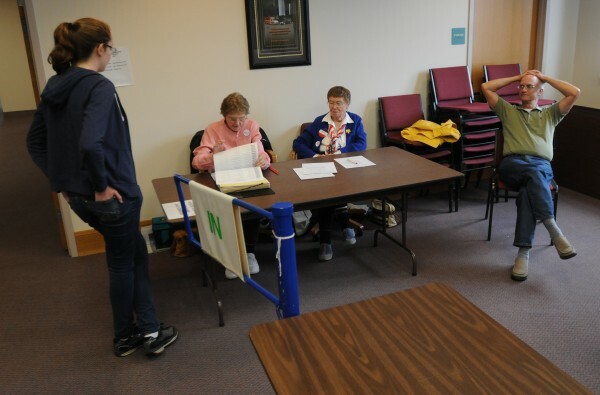 Voter turnout was 4 percent for the election held at the Community Center, City Clerk Sue Mooney said. Voters also approved continuing the education budget referendums for the next three years by a 465-311 vote. BETHEL — The five member towns of SAD 44 approved a proposed $10,371,000 budget Tuesday for school year 2013-14 by a vote of 299-222. Only Andover, with a vote of 31-50, voted the budget down. Newry residents tied at 23-23. The other three towns voted in favor with Bethel approving the figure with a 170-127 vote; Greenwood, 24-6; and Woodstock, 51-16. Voters in Brunswick approved a $35 million school budget for fiscal year 2014. The budget was approved by 56 percent in a 735-558 vote, the lowest support in several years. Voters also supported continuing the school budget referendum process for the next three years in a 868-407 vote. Voters here elected two selectmen and a school committee member in local elections on Tuesday. They also granted permission in a 236-98 vote to spend up to three months of budget money so the town can continue to operate beyond the end of this fiscal year on June 30. That vote was taken because town officials have decided to delay the annual town meeting — during which voters approve the annual municipal and school operating budgets — until after the new fiscal year has begun due to uncertainties over how much the town can expect in state revenues under Gov. Paul LePage’s budget proposal. Although a date has yet to be set for the town meeting, Town Manager Dawn Adams said the goal was to hold it by mid- to late July. In local elections, voters returned incumbent Michael Georgia to the Board of Selectmen with 219 votes. They elected Cory LaBelle to the board seat now held by Scott Libby, who opted not to run again, with 240 votes. Gregory Hobson, who also ran, received 72 votes. Siblings Mark Dyer and Susan Campbell won seats in the town’s first contested secret-ballot election on the Board of Selectmen. Dyer, an incumbent, and Campbell won by comfortable margins against challengers Nelson David Stevens and Peter Pellerin for two seats on the board. Selectman Mary Holt did not seek re-election. For school board, incumbent Carol White secured 181 votes in her uncontested race for one of the seats. More than 150 votes were cast among five write-in candidates. Suzanne Rugh garnered 75 votes for the other seat, while the two nearest write-in candidates — Suhail Bisharat and Nancy Hill — earned 46 and 33 votes, respectively. Voters narrowly passed the $11.7 million bond to remake Route 1 by just 81 votes — 1,240 to 1,151 — while easily passing the $30.2 million school budget, 1,758 to 581. The budget represents a 4 percent increase from the previous budget. The $3.25 million bond to upgrade the heating system passed 1,840 to 526. The $1.7 million bond to renovate classrooms and replace and strengthen part of the school’s roof passed in similar fashion with a total vote count of 1,756 to 612. Voters overwhelmingly elected Caryn Bickerstaff and Clare Harrington to the School Board in a four-way race for two seats. Harrington hauled in the most votes with 1,604, followed by Bickerstaff who received 1,565 votes. The other two candidates, Michael Doyle and Susan Coughlin, received 513 and 477 votes, respectively. Voters voted to approve the purchase of a new sewer vacuum truck, 282 to 182, and approved a $14.5 million school budget representing a 2.2 percent increase over last year’s with a 325 to 141 vote. Residents also voted 375 to 89 to continue the school budget referendum process. Voters elected Stephen Cooper and Peter Rioux to the town council with 133 and 106 votes, respectively. Corey Ginn received 98, Philip Foley received 85 and Joseph Brooks received 80 votes. Residents cast 225 votes for Lance El-Hajj as RSU 22 director and 208 votes for Martha Harris. Holden voters elected two town councilors and a SAD 63 board member in local elections on Tuesday. They also approved all eight of the town charter amendments put before them. Incumbent candidate Paul Amoroso was returned to the town council for another three years with 179 votes. Thomas Copeland, the top vote getter with 229 ballots cast in his name, won the other seat. Malcolm Coulter Jr., a planning board member, also ran. He received 87 votes. Incumbent Christopher Doering was re-elected to the SAD 63 board of directors with 115 votes. Christopher Galinski, who also ran, had 77 votes. The Holden annual town meeting is scheduled for 7 p.m. Wednesday at Holden Elementary School. Residents will vote on the municipal budget and two annual warrant articles regarding rules for allocating local matching funds and setting aside $100,000 in case it’s needed for the planned Interstate 395-Route 9 connector. The proposed 2013-14 municipal operating budget totals $2,389,305, up $18,338 from this year’s $2,370,967 budget. Benjamin Cabot was selected as a selectman for a one-year term with 169 votes. Roger Kaufman received the next most votes with 75, followed by Mary Merchant, 61; Kenneth Finnemore, 32; Glen Villane, 23. Gail D’Agostino and Jane Conroy were also elected three-year term selectmen positions with 256 votes and 220, respectively. Jeffrey Merchant received 111 votes. Amy Fagan-Cannon was selected to the Thompson Free Library Executive Committee with 344 votes. Christopher Clukey defeated Christopher Maas 224 to 135 for the three-year HAD 4 director’s position. Marc Poulin and Jennifer Chase were both elected to the RSU 68 board of directors for three-year positions. Christopher Maas received 161 votes. Dover-Foxcroft voters passed the RSU 68 2013-2013 school budget with a tally of 267-96. They also voted to keep the budget validation referendum process for another three years, 242-117. PITTSFIELD — Voters in three members town barely passed SAD 53’s 2013-2014 budget of $10,230,566. Residents in Burnham, Detroit and Pittsfield collectively voted 88 to 71 to approve the budget. Burnham 21-24, Detroit 10-12, Pittsfield 57-35. NEW GLOUCESTER — Voters approved the proposed budget 929-420 and voted to continue the two-step budget approval process for another three years 983-348. Voters in Gray approved the budget 359-201 and voted to continue the approval process 428-129. In New Gloucester, voters approved the budget 570-219 and the two-step process 555-219. Voters in New Gloucester elected Alan B. Rich Jr. to the school board with 593 votes. Amy B. Arata received 522 votes. Voters in Gray elected Belinda J. Desmond over Will H. Burrow for school board, 383-370. Voters elected Matthew M. Doughty to the town council for a three-year term over Norman L. Tanguay, 343-183. Bruce R. Sawyer ran unopposed for the Gray Water District and received 516 votes. Voters approved all nine municipal warrants on the ballot. Voters approved the school budget 375-106, and voted to continue the two-step budget approval process 317-163. The $32.3 million budget is up $1.4 million from the previous year, but will have no impact on the local tax rate. FAIRFIELD — Although Fairfield turned down SAD 49’s 2013-2014 budget of $24,777,600, the other three members towns approved it. The budget passed for a total of 587-432. Fairfield residents voted against the budget 185-141. Albion passed it 75-25, as did Benton 78-62 and Clinton 298-160. Correction: The figures for Parkman given to the Bangor Daily News on Tuesday night and subsequently printed in Wednesday’s paper were inaccurate. Parkman residents voted against continuing the budget referendum for three more years by a 14-9 vote, and not a 19-9 vote, as was given to the BDN. This caused the overall figure to change from a 109-107 defeat of the article, as was printed in the paper, to a 107-104 passage of the article.